On January 3, 1954, exactly 60 years ago, an editorial article written by Merlo Pusey, an associate editor for the Washington Post, became the flashpoint for an issue that remains with us today and will no doubt be debated into the future. The editorial suggested the Post supported the proposal for constructing a scenic road to accommodate the new expanding automobile culture. The U.S. government had proposed building a parkway that would essentially pave over the old 185-mile C&O Canal. It represented a case for “progress” versus a growing chorus of “conservationists” that would evolve into the preservation and environmental movements. The case for building the road was that many more could enjoy the beauty of the river by a view from their car, rather than having fewer enjoy it by foot. It was simply a more efficient way of enjoying nature. Such a project would still provide recreation and even an economic boost to the communities along the route in terms of commerce and jobs. But, others argued it would trample on the natural beauty of the area which could never be reversed. 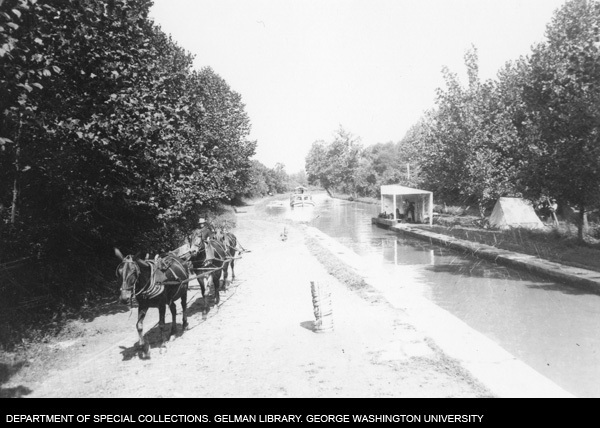 The canal had served as an important route of transportation for goods along the Potomac for a century. But, soon after the C&O and other canals in the northeast began operating in the mid-1800’s, railroads began to replace the slower, limited transportation that the canals provided. No one denied that the C&O as a commercial highway was now obsolete, a victim long ago of progress. In fact, the B&O railroad developed rail lines that ran the same route. It eventually acquired the canal and moved most of its business to rail. Having ceased all operations by 1924, the B&O transferred ownership of the canal to the U.S. government in 1938 which hoped to turn it into a recreation area. Additionally, it was viewed as a project for employment for the jobless during the Great Depression. The first 22 miles from Georgetown to Violette’s Lock were repaired by 1940. The war effort halted further development. But, after the war studies were made for various uses and construction projects. 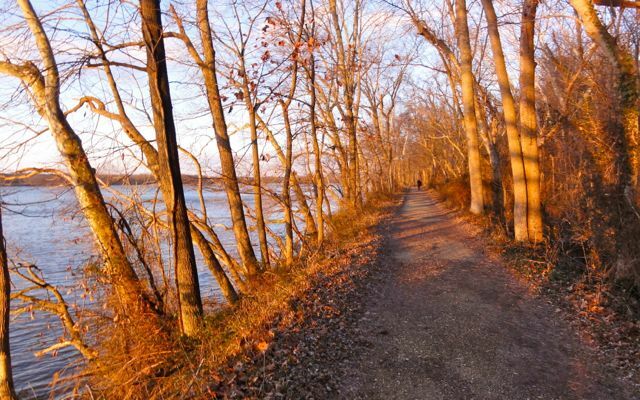 In 1950, the assistant Secretary of the Interior suggested building a highway on the canal property along the Potomac. At this time, Eisenhower’s interstate highway system was being constructed and new roads were popular government projects. It is a place for boys and girls, men and women. One can hike fifteen or twenty miles on a Sunday afternoon, or sleep on high dry ground in the quiet of a forest, or just go and sit with no sound except for water lapping at one’s feet. It is a sanctuary for everyone who loves woods a sanctuary that would be utterly destroyed by a fine two-lane highway. I wish the man who wrote that editorial…would take time off and come with me. We would go with packs on our backs and hike the 185 miles to Cumberland. I feel that if your editor did, he would return a new man and use the power of your great editorial page to help keep this sanctuary untouched. Merlo Pusey and fellow editor Robert Esterbrook were surprised by the response. Seeing a good news story, they responded by accepting the challenge. Douglas envisioned a small party of hikers on a backpacking journey tackling the 185 miles with ample opportunity to persuade them. Instead, frenzy of interest began involving the press and conservation groups. 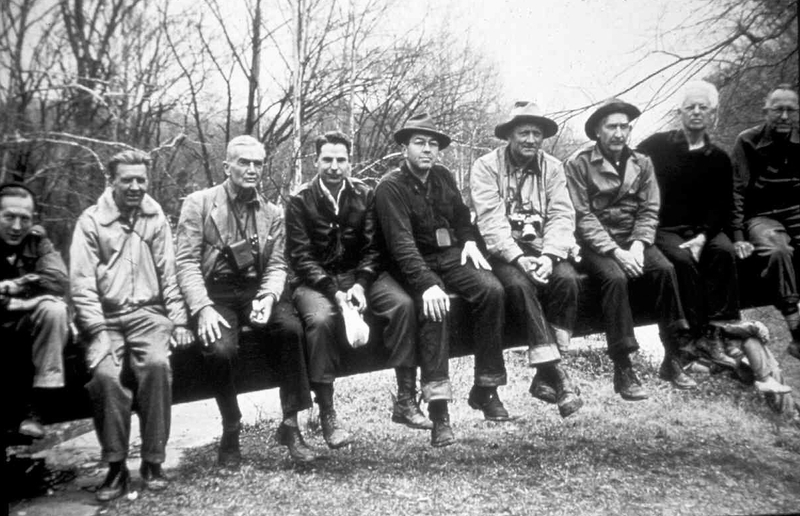 On March 20, 1954, the group of 58 – conservationists, scientists, local citizens and 5 press writers –eagerly began their adventure. The group had quickly grown into a well-supplied media tour drawing much media attention along the way. Douglas, in fine shape, kept up a relentless 4 mile-per-hour pace. Many dropped out in the first few days. Esterbrook withdrew and Pusey continued trailing along on horseback. There are many stories of encounters along the way. A woman met the group and requested Douglas address the problem of mosquitoes along the canal. An 81-year-old man told the hikers about his work as a mule driver on the canal. A large group of residents greeted the Douglas and the group at Shepherdstown. A civics class from Hancock greeted the group on the towpath. And, there was a story of Douglas pulling himself up the side of the mountain where the towpath washed away. There were no women to join the walk, or perhaps they were not invited. The stories report a buffet dinner with champagne at the Woodmont Rod and Gun Club, hosted by Henry Bridges; bacon and eggs cooked by the men of the Potomac Appalachian Trail Club; a buffalo meat and salmon feast offered by “the Izaak Walton boys.” One reporter even includes a pancake recipe used by one of the PATC men. In a total of eight days, nine were to make the entire 185-mile distance. The “Immortal Nine” hikers arrived in Georgetown on March 28th to a cheering crowd of 5,000 people. The Post retracted its original position and agreed that some of the canal was worth saving but did not fully support either side. 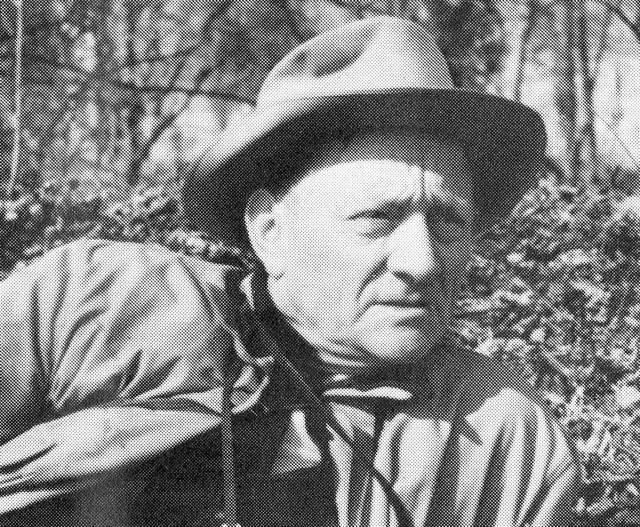 The story of one man’s obsession to save a piece of the wilderness gained national attention. Douglas then helped form the Chesapeake and Ohio Canal Association which even today advocates for the preservation of the canal. 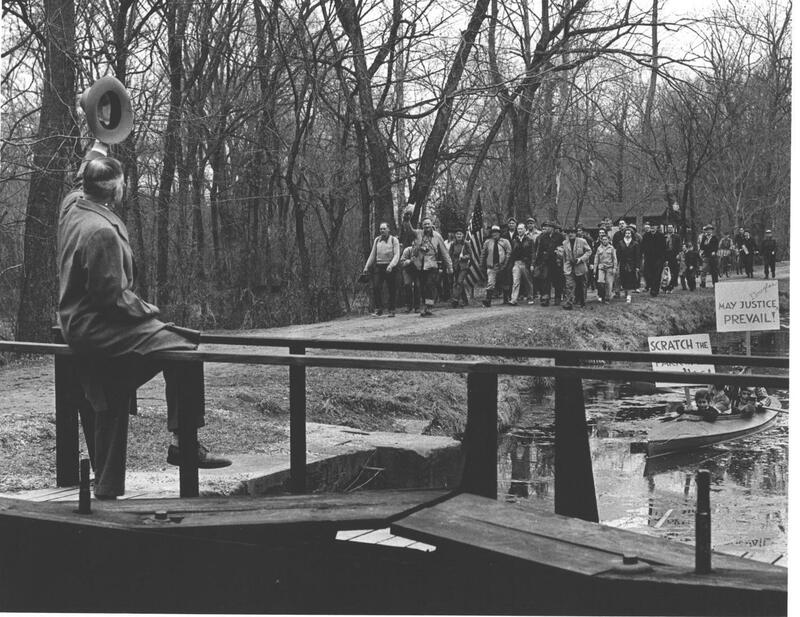 The parkway plans were halted as a result and President Eisenhower gave the towpath federal protection in 1961. However, it was not until 1971 that it became the Chesapeake & Ohio Canal National Historical Park. Today, over 4 million visitors annually use the park for outdoor recreation. Douglas’ efforts were recognized in 1977 with a statue at the head of the towpath trail in Georgetown. His portrait is now on display at the Great Falls Tavern Visitor’s Center. 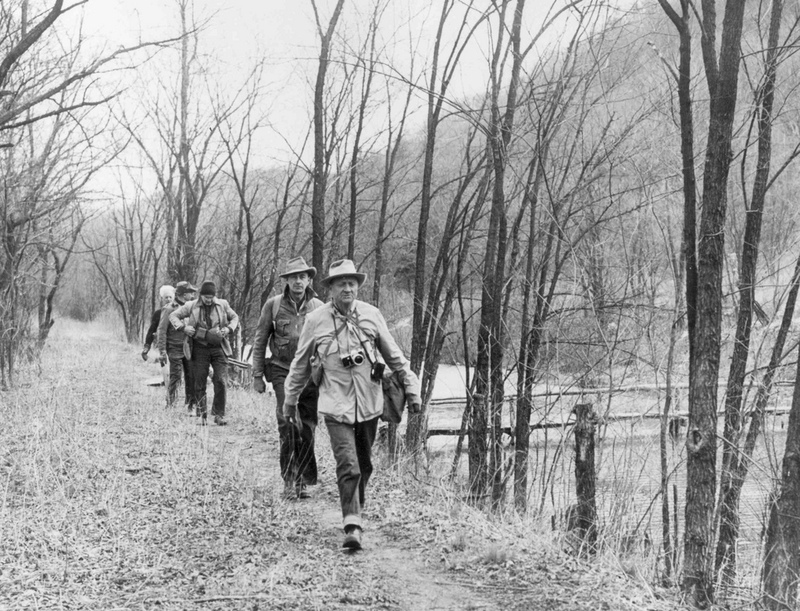 Stories of his walks and encounters are now part of the legend of the C&O Canal. Exploratorius linked to this post. Some thought before our 50-Mile Walk on Feb 7th. I wish there was a group that covers the entire canal. Unfortunately, the logistics is such that walking alone is difficult. Someday the FreeWalkers may try this as a multi-day adventure. The topic has come up before.